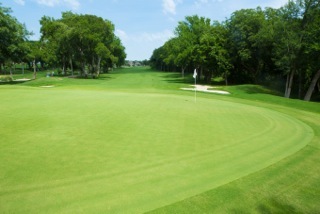 Enjoy Challenging Fort Worth Golf Course at the Resort! Picture rolling North Texas hills, live oaks and wildlife frolicking along the edges of the eastern shore of beautiful Eagle Mountain Lake. That’s what you’ll find on The Golf Club at the Resort’s 6,626-yard, par 72, 18-hole championship course. We welcome free play currently, but our long-term goal is to transition to a private club. For that reason, you’ll feel like a member for a day at a luxurious country club. In 2006, we completely designed The Golf Club at the Resort’s course, transforming it into one of the finest layouts in Northern Texas and Fort Worth golf. The holes strike a perfect balance between tight, challenging shot selections that demand accuracy, and open, forgiving tees. Make sure you bring a deft touch with your iron game as you maneuver the holes guarded by water, rock walls and raised greens. Watch out for the bunkers near the greens. Our course tends to reward skill above brute strength. The course will likely leave you wanting more; providing a different experience each time you play it.